I love making holiday wreaths. In fact, I have made so many I think we are going to need some more doors! 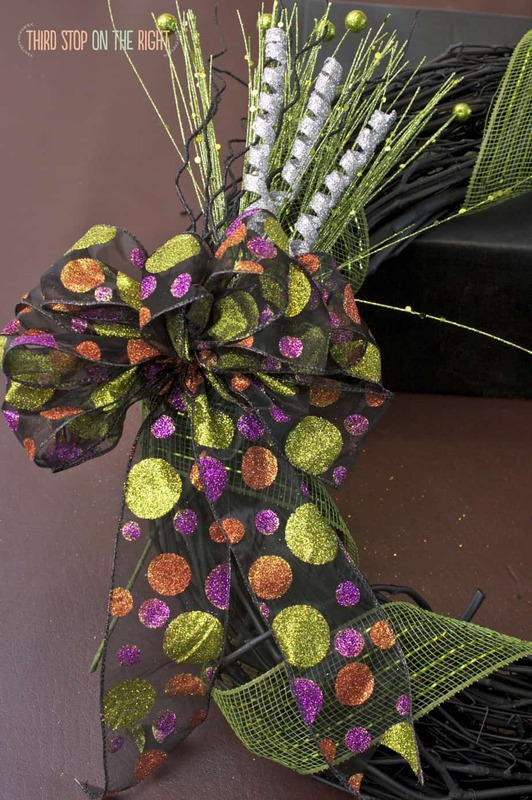 However, this Halloween wreath is probably one of my favorites. The truth is, when I started out making it, I didn’t really have any hard and fast plan in mind, but just sort of went where the wind took me! In the end, I was super happy with the results and want to show you how to make one too! Ok, so lets get started! 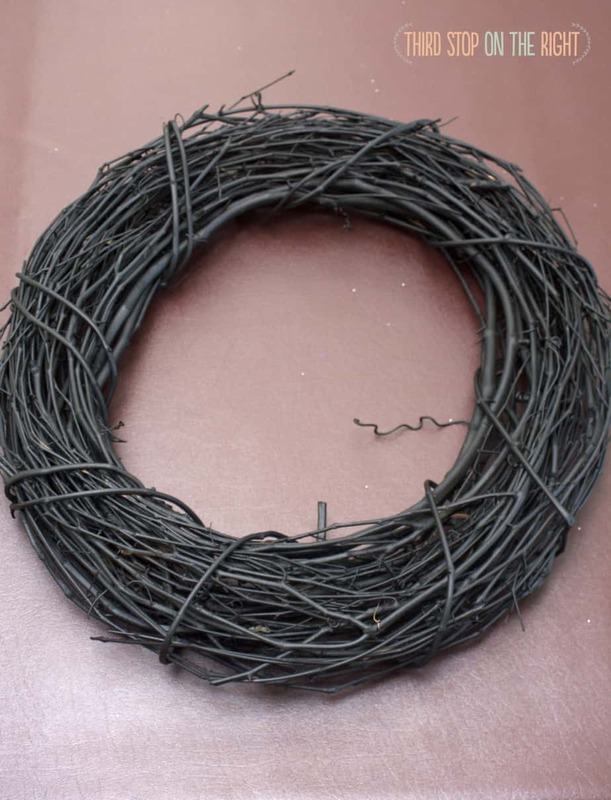 The first thing I did was spray paint the entire grape vine wreath black. 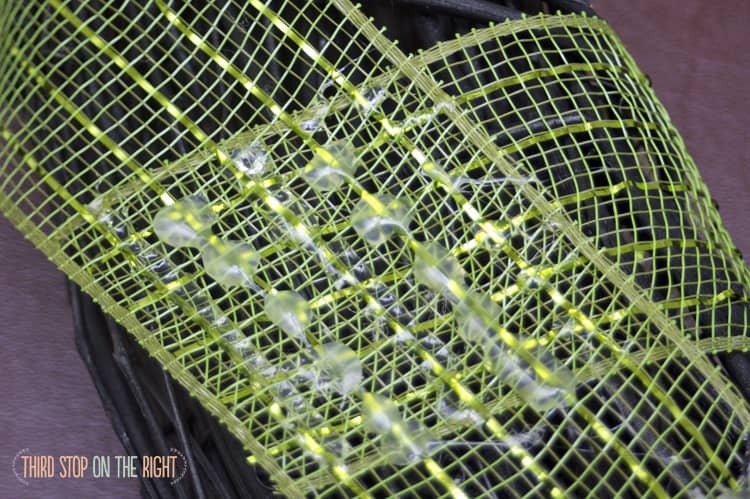 It may take a couple of coats to get it all covered as you have to make sure you get inside all of the nooks and crannies in the grape vines. 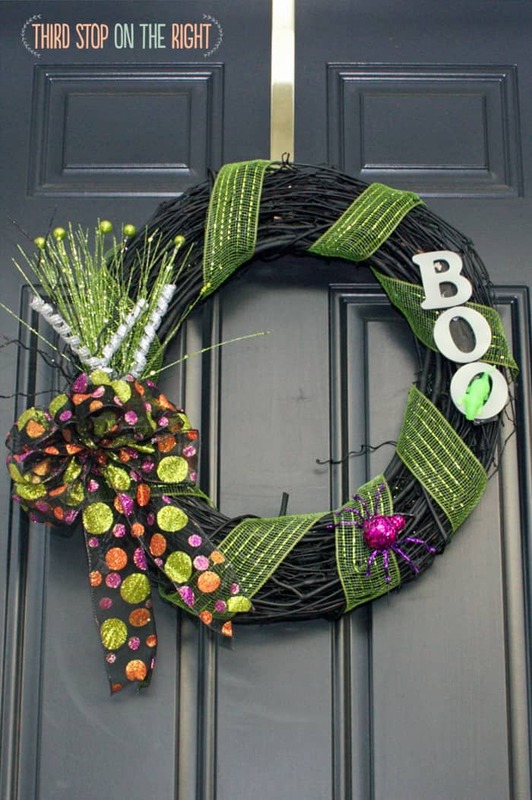 Once you have spray painted the entire wreath you are then going to want to wrap the ribbon around it. I chose a plain mesh ribbon so that you could still see some of the wreath through it. I also didn’t want the ribbon to detract from the other embellishments around it. After wrapping the wreath, I then glued the ends to the back of the wreath. You could also secure them using wire if you wanted to, but I don’t know how well it would hold. I will admit, I did purchase the bow for the wreath premade at Michaels. This was because I loved the design of the bow and they didn’t seem to have any of that ribbon on the spools. Plus, when I used one of the 40% off coupons it pretty much made it the same price as if I made it myself. I tucked some embellishments in behind the bow. The possibilities on what you can use are pretty much endless, but I chose to use some sparkly sprays, curls, and a few creepy sticks. I glued all of these down with hot glue in order to secure them. 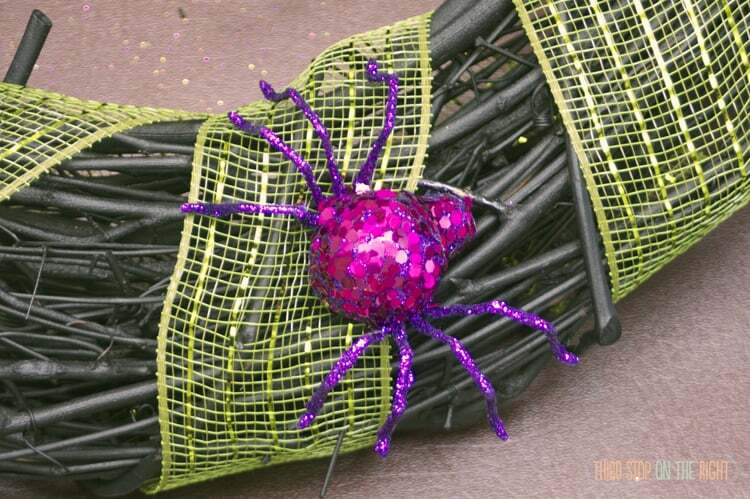 Since the sprays I used were the same color as the ribbon wrapping the wreath I wanted to add something with a little contrast which is why I went with the pink sparkly spider. It gave it that creepy feeling while still bringing out all of the bold colors. Now here is my favorite part of the wreath. 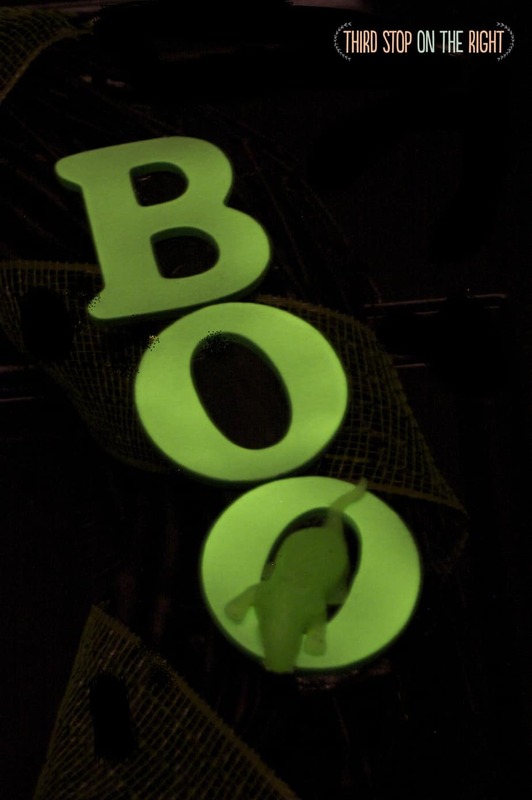 The part that just “makes it” for me — the glow-in-the-dark part! 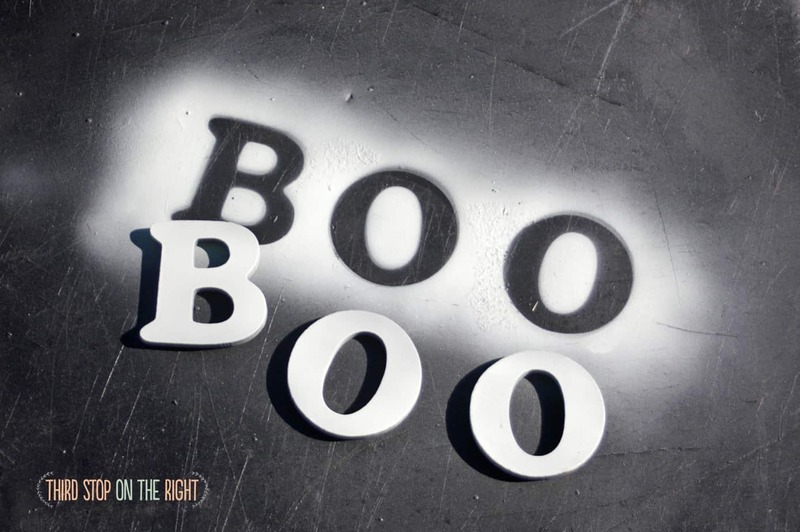 I started by spray painting the wooden letters with the glow-in-the-dark paint. I did a couple of coats of the paint in order to maximize its effectiveness. 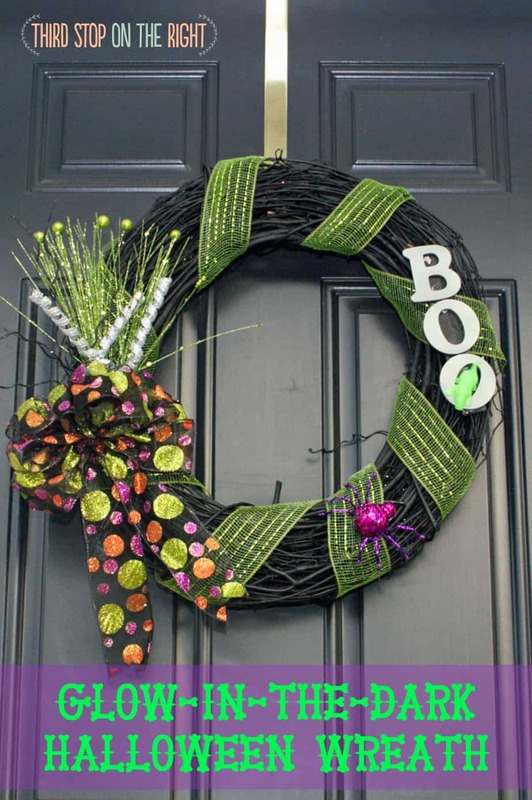 I chose to spell out the word BOO but depending on the overall size of your wreath you could always do something a little longer. I contemplated a couple of different ways to attach the letters, but no matter how I laid them out they ended up really crooked (and not the spooky crooked way, but the it just doesn’t look right way). I tried to figure out how to remedy this so that the letters would all be at the same level. I ended up deciding to paint a paint stirrer black and then glue the letters onto that. 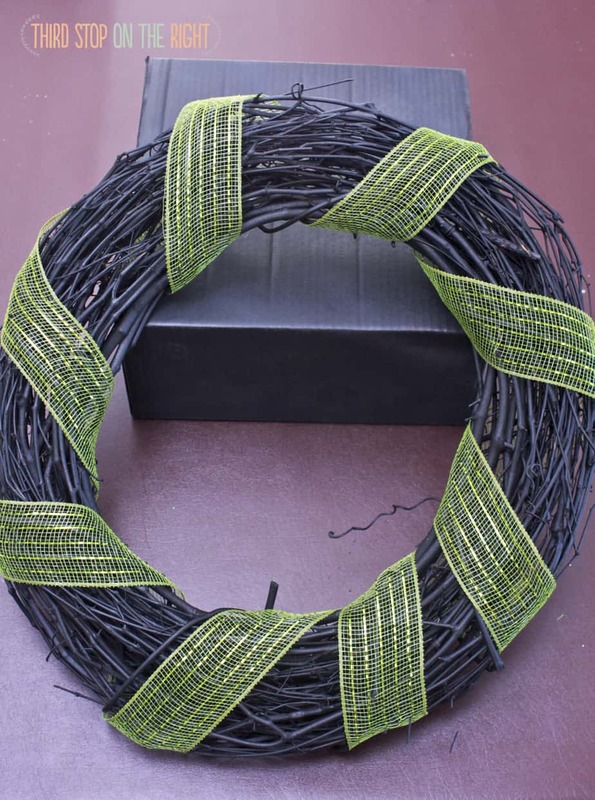 I could then attach the stick to the wreath which would make them all stay in a line and be at the same level. If you don’t have a paint stirrer you could always use one of the fat popsicle sticks, although the stirrer allows for longer words. All you have to do is as for a few at the paint counter at Lowes or Home Depot. And when it gets dark, you have a really cool effect! This wreath only costs approximately $30 to make, but if you already have some of the supplies on-hand, combined with some of the craft store coupons, it can actually cost much less! The paint drying is what takes the longest, so I recommend painting the wreath and the letters ahead of time. Once you have done those, the rest can be completed in one afternoon, and then you have an awesome glow-in-the-dark Halloween wreath!